Aeronautical aircraft antenna yagi beam's and ground plan antenna designed for the reception of secondary radar of civil aircraft, virtual radar. Antenna for the reception of the ADS-B/Mode-S aircraft beacon (Secondary surveillance radar (SSR), Downlink Frequency 1090 MHz), Antennas for virtual Radar. Secondary surveillance radar (SSR) is a radar system used in air traffic control (ATC), which not only detects and measures the position of aircraft but also requests additional information from the aircraft itself such as its identity and altitude. 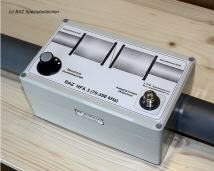 Aeronautical radio uses the frequency range from 117,975 to 137 MHz. From the original grid of the radios with a channel spacing of 25 kHz 720 voice channel resulted in this frequency range. The by far higher requirement at channels led meanwhile to the development of radios with a channel spacing of only 8.33 kHz; from it a trebling of the profitable radio links results. Aeronautical radio is always amplitude-modulated. It is executed in the operating mode „intercommunication “, which means that the response on the same frequency been affected as the calling. It can be consignment or received at any one time only in each case either.